If you are familiar at all with Tarot, then you probably know it offers you a form of divination to foresee future obstacles if you continue on your present path in a situation. By making a change however in your present, you can change the future outcome. It gives you a direct method of obtaining information not available to the physical five senses. 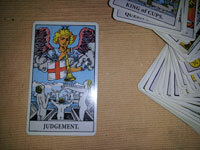 But here are three things you may be surprised to find out about the Tarot. 1. A properly keyed tarot deck is an actual model and reflection of the Universe. Taking the time to key each of the cards attunes it to your own personal energies which will make your Tarot spreads personal and create a connection between you and the cards. During 12-card readings your tarot spread will show you the past and present for any situation you are reading that you will recognize from your own past conditions and where you are at presently. Then flow lines will show you what future conditions you can expect if you continue in the same manner or what changes can occur if you make changes in the present. The success of these type readings depends on picking signifiers for the person and situation being read. 2. Since your deck is keyed to represent a model of the Universe you can change the universe by changing a tarot reading using a tarot spell. Once you have the tarot spread laid out that you have decided needs a change in the present to change the future, you can set up a spell matrix using candles and spell verses around the spread. Making the card changes in the tarot spread within a spell matrix creates that change in real life. 3. The proper interpretation of the cards has to be done through keying and studying the cards of certain decks, such as the Thoth deck and Waite-Ryder (other decks have their purpose, but truly useful tarot decks reflect their true meanings with their images and thus lead to proper interpretation). Just memorizing meanings of cards or going by standard book definitions is really restricting. By keying the cards and "wearing" them around to get the feel of each, you become personally connected and are able to see enhanced meanings of them. Find any surprises there? If you are interested in becoming adept at using the Tarot and learning to do tarot spreads and readings, our online Tarot Couse is for you. It will take you through how to key your deck, how to pick appropriate signifiers for people and situations and how to do Celtic Cross and 12-card readings. Make the Tarot come alive for you and help you use magic to get the results you want in your life. Love Magic? Pass it On!